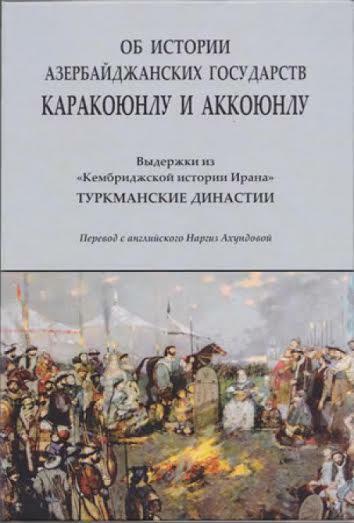 The History Institute at the Azerbaijan National Academy of Sciences has published a new book "Turkman dynasties" about the Kara Koyunlu and Ak Koyunlu Turkic tribal federations. The new edition contains translation of 6th volume of the book "Cambridge history of Iran", which covers the history and historical geography of the land which is present-day Iran, as well as other territories inhabited by peoples of Iranian descent, from prehistoric times up to the present. The historical book has been translated by PhD Nargiz Akhundova. The book, which contains dictionary of 15th century, describes historical events that took place during the reign of dynasties. The project's editor is director of History Institute, MP Yaqub Makhmudov. The manual that describes historical events of the Middle Ages is intended for the attention of broad reading audience, including students and teachers. The National Academy of Sciences is the main state research organization and the primary body that conducts research and coordinates activities in the fields of science and social sciences in Azerbaijan. It was established on 23 January 1945.